Some interior design blogs say that a grey sofa is boring or unoriginal. We disagree. In fact, a grey sofa has more decorating potential than any other furniture piece in your home. Think of a grey sofa as a blank canvas with an infinite number of decor combinations. 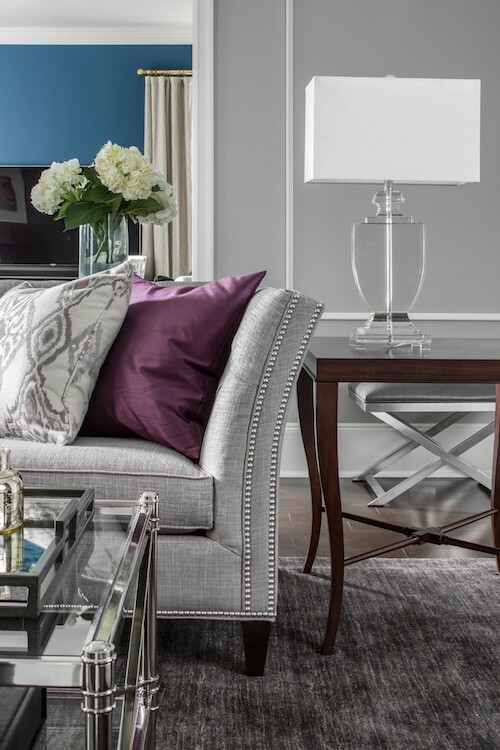 Our senior designers have these tips for styling a grey sofa. The first step in decorating your couch is pillows. And with a grey couch, we recommend one layer of high-sheen pillows and another layer of pillows with a more matte fabric. Pick high-sheen pillows that echo colors found elsewhere in the room, like we did in this luxurious, transitional redesign. And when the weather gets cold, pile on the throws to keep yourself cozy. Throws can be swapped out easily (and usually returned) so try out unexpected combinations and see what sticks. Pick a color or material that contrasts against the fabric of your sofa, like we did in this light-filled high-rise. With any interior design scheme, it’s important to consider the shape and contour of your furniture pieces. So if you have a square sofa, consider a coffee table with a bit of curve. 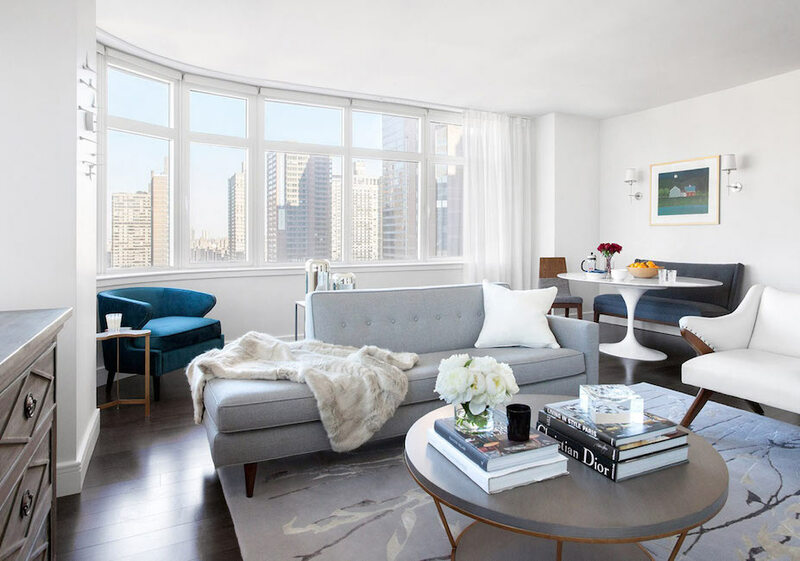 In this SoHo duplex, we sourced a stone-shaped coffee table from Phillips collection, to balance out the room’s angular elements. Styling a grey sofa is all about creating contrast. So we outfitted the velvet sofa in this mid-century palace with matching wood end tables. Like bedside tables, place matching pieces on either side of your sofa, and lay out a few coasters while you’re at it. To keep your sofa from looking haphazard, corral everything together with a few baskets. En leu of end tables, we placed bamboo baskets on either side of the leather sofas in this chic, Union Square loft. Artwork is an integral part of any living room. And when styling a grey sofa, make sure that your accesories reference the colors in your artwork. 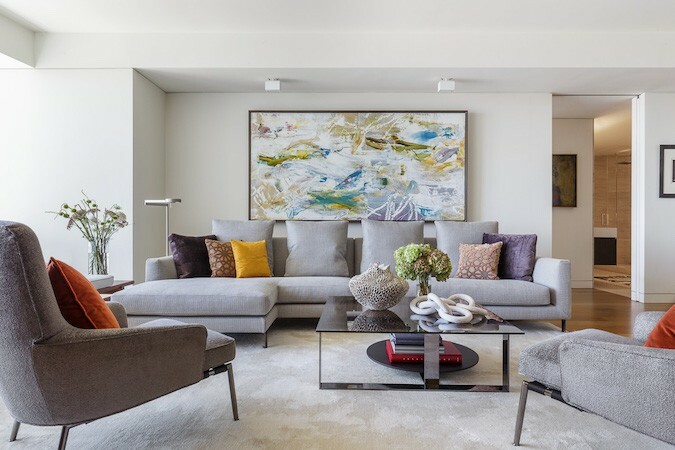 Notice in this San Francisco luxury condo how the pillows echo the colors in the client’s artwork. Lighting is an essential part of your living room, and you should have at least one source that’s specifically for your sofa. 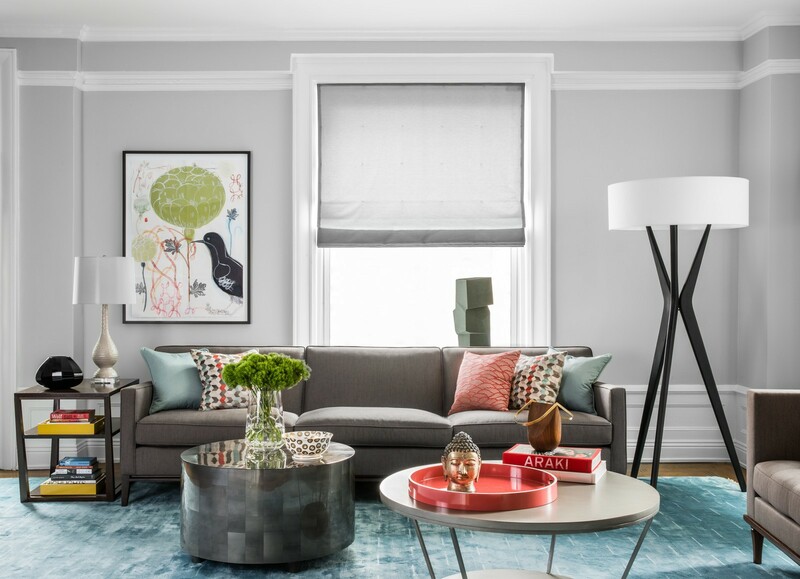 In this Upper West Side family room, we put two lamps on either side of this grey sofa: a larger lamp for a base layer of lighting, and a table lamp for reading. When styling your couch, remember to include some vertical design elements, as a way of contrasting the horizontal layout of your couch. One way to do this is to flank your couch with tall plants. 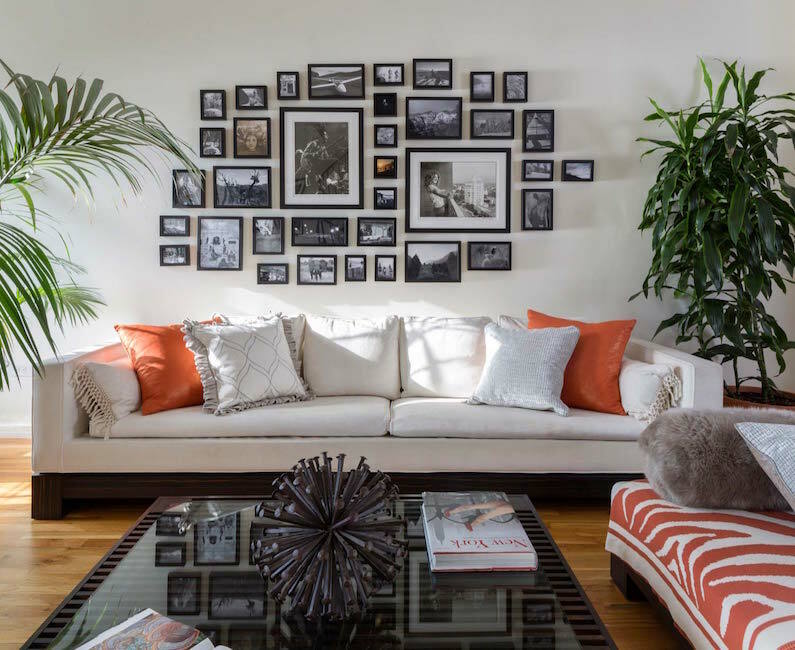 In this pre-war bachelor pad, we placed two plants on either side of this grey sofa, drawing the eye towards a tasteful gallery wall. Area rugs are a great way to add some needed texture or pattern to your space. And to keep your space feeling cohesive, source an area rug that incorporates colors found elsewhere in your design scheme. 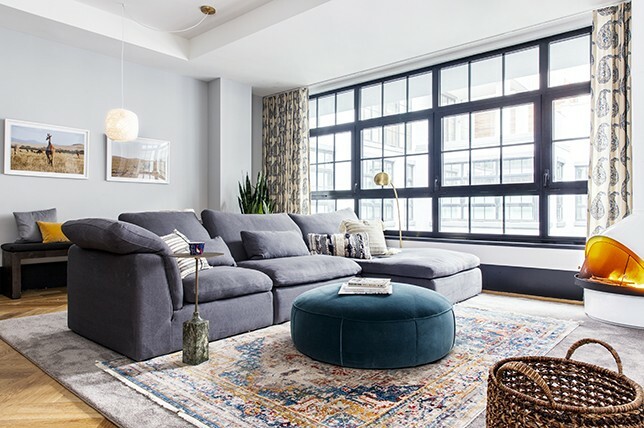 Pro tip: when laying out your living room, place your couch along the perimeter of your area rug, like we did in this chic TriBeCa loft. Add a sense of the unexpected by bringing in indulgent pops of color in even the smallest of doses. 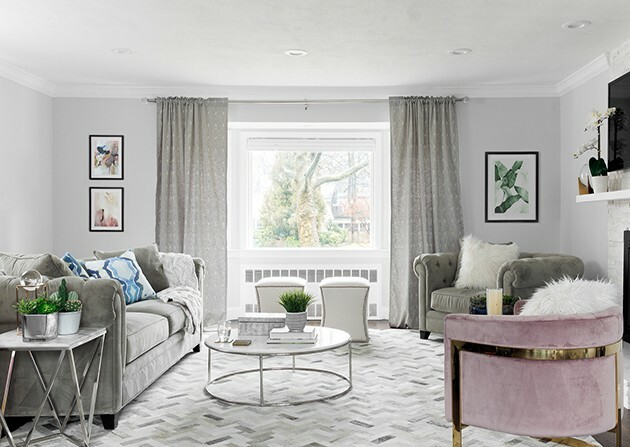 While about 95% of the project featured above thrives in various shades of gray, an equally subtle, muted pink chair was added as an alluring element to make the living room all the more memorable and unique. For this eclectic family home in Brooklyn, our interior designer used the plum gray sofa pictured above as a starting point to add harmony to a litany of the diverse elements and features our client had her mind on. As you can see, it works to brilliantly tie everything together unlike any other colored couch could. Imagine the visual noise one would feel if the sofa was firey red, or how lost it would look in the room if it was pure white. Who says that a gray sofa means all business and no play? Like we did for this family home in Old Greenwich, CT, use a gray sofa to counteract more playful elements, such as the kid’s toys housed in this playroom. Your gray sofa will end up doing double duty as an anchor for all of the various elements they love playing with and will be able withstand stains much better than a lighter colored sofa ever could. Since gray evokes a sense of balanced strength, take it up a notch and go completely symmetrical with your furniture layout for a soothing, uniformed feel. By doing so, you’ll have a much easier time decorating around your gray sofa rather than having to compete with it. The key here is find ways you can incorporate visual interest without being distracting. Again, this is where the strength of pillows and prints come into play as the room featured above would be left with an undeniable coldness without them. Strike a chord with your stylish gray sofa by keeping the rest of the room simple and decorated with a light hand to keep everything easy on the eye while still stimulating. 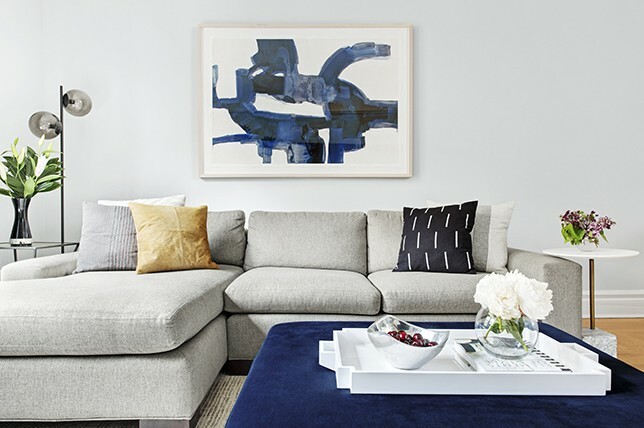 For the project featured above, our interior designer mirrored the rigid lines of the gray sofa with pillows boasting vertical interest, and furnishings and accessories that followed suit. 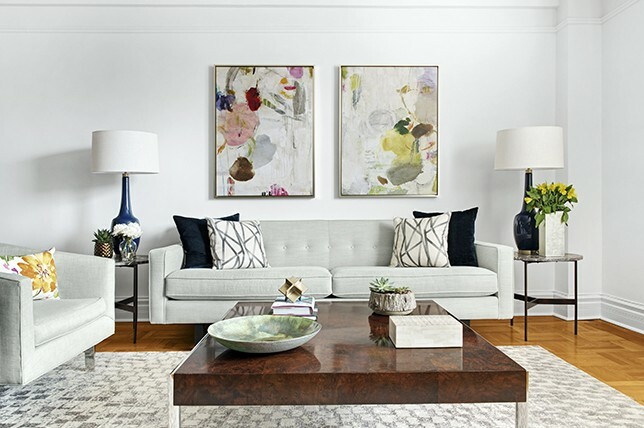 The key here was to offset the strictness of the set up with abstract elements like the watercolor hung above the gray sofa and various accessories throughout. 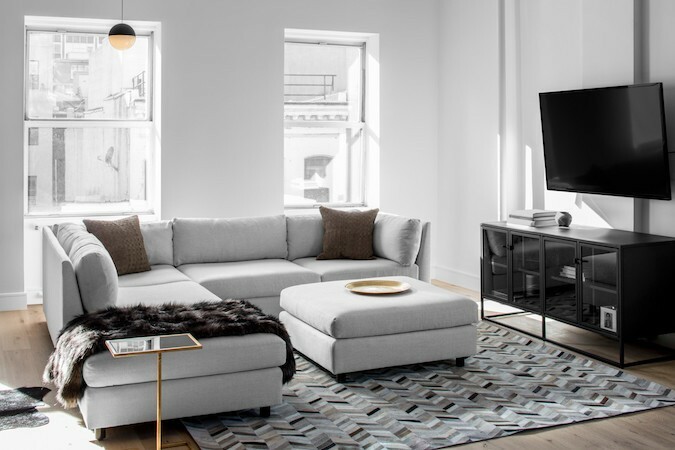 As a gray sofa is a standard fixture in any minimally designed home, amp up its spartan appeal with a range of tonal gray hues spread about to create a comforting take on warm minimalism. 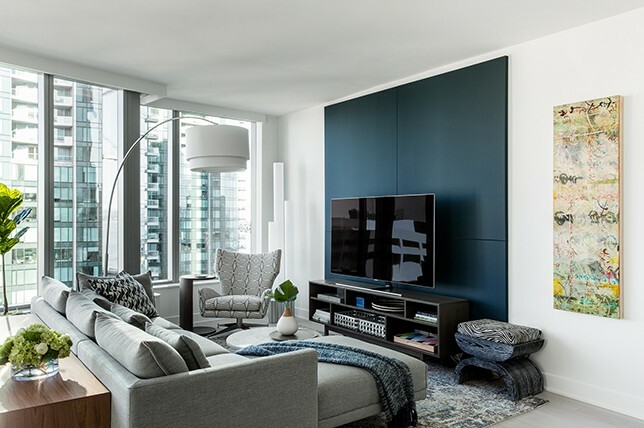 To accentuate our project’s decidedly gray direction in San Francisco, our interior designer emphasized the living rooms all gray focus by placing deep gray blue canvases behind the t.v as a stimulating backdrop full of energy and spirit.